Chapter President Jeff DeLong presents Tyler McCubbins with a certificate recognizing his award of an ASHRAE Scholarship. Jeff Gibson presents Jeff DeLong with a $1500.00 check for Research Promotion! Sharon Evers, our Olympic presenter, with the torch that she carried in 1996. Musical entertainment by Tim and Jonah. Our annual Christmas party and Past President's Night was a great event, well attended, and with a variety of entertainment! Sixty to seventy attendees were treated to a great meal, a gold-medal worthy Olympic presentation, and Christmas Caroling! Thanks and congratulation to all who contributed. The holiday season is upon us, and it will soon be time for our annual Past-President's Night and Christmas Party. Cherokee Country Club will once again be the venue for our special event. Anne Jacoby & Tom Pace have been our party planners this year, and they have a special event in store for us! Social hour will begin at 6:00 pm and there will be a cash bar and hors d'oeuvres, with each attendee having one free drink ticket as part of their admission. Background music will be by Tim and Jonah. We encourage everyone to come early and socialize! Dinner will begin at 7:15, and will feature the excellent cuisine of the Cherokee Country Club kitchen. Our program will feature Sharon Evers. Sharon has been an Olympic enthusiast since her high school days. She had a sports column in her high school newspaper - one time she wrote an article about the Olympics and she became hooked. She still has the article! 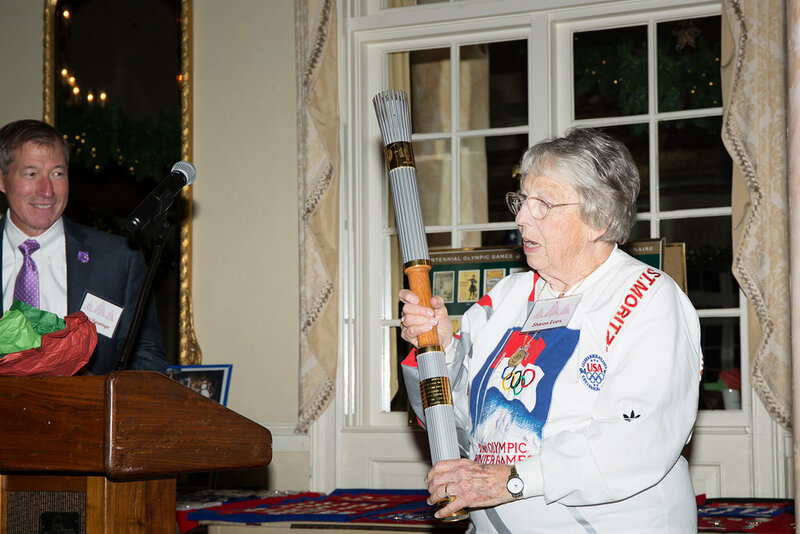 In 1996, she was a "torchbearer" in the days leading up to the summer games in Atlanta. She has traveled widely over the years in the pursuit of all things Olympics, and she speaks several time each year to share her experiences. Sharon has an extensive collection of memorabilia, and a portion will be on display at the party. Save your entry ticket, as door prizes will be offered to several lucky attendees! Complimentary valet parking will be available, and we encourage all attendees to utilize the service as on-site parking is limited. Single tickets are $50.00, each additional ticket is $40.00. Past Presidents of our chapter are entitled to a complimentary ticket. Cherokee Country Club is located at 5138 Lyons View Pike; Knoxville, 37919, not far from the Papermill / Northshore Drive exit from Interstate 40. Please feel free to pass this invitation along to others who may be interested in attending. In order to confirm your attendance, please RSVP to Anne Jacoby at ajacoby@hobbstn.com before Thursday, December 8th at 12:00 noon. Guests are more than invited to attend! Thanks to Mark Johnson, Calmac, for the great October program on ice storage! An underwhelming RSVP number, followed by an overwhelming show at the door, created some logistical challenges for us, but kudos to our president, Jeff DeLong for managing this well and our host Rothchild Catering for responding quickly. Pictured above is Mark Johnson, speaker, and chapter member Duke Bennett. Mark and Duke go back a few years and enjoyed the chance to renew that friendship! On October 19th, David Grant let a tour of over a dozen chapter members and guests on a tour of ORNL facilites. Included in the tour was the supercomputing center and research and development laboratories. The heating and cooling facilities for each were included in the tour. David's tour was a perfect complement to his recent program on data center cooling and ASHRAE Standard 90.4, Energy Standard for Data Centers. We appreciate the open door from Oak Ridge National Laboratory, and Van Baxter's help on this alongside David. Great job guys! Jack Hopkins, 1996/97 President, presents Susan Rothchild with a 20-year Appreciation Award. Our September meeting was a resounding success! It seems like we had to fight for parking, find additional seating, wait a bit longer in line, but the meeting was one of the more memorable season openers in several years! Congratulations to new president Jeff DeLong who is off to a good start. Pictured above are several of our awards recipients from CRC. The photographer apologizes for the lighting - we'll have to break out that flash next time! Let's keep the great attendance flowing! Chapters Regional Conference - Birmingham! It is that time of year again! Our Region VII Chapters Regional Conference (CRC) will be hosted by the Birmingham Chapter this year on August 4-6, 2016. A mix of the Old and New South, the event will anchor at the brand new Westin Hotel in Uptown B'ham and feature side trips to the Vulcan Park and to the Barber Museum. Dr. Chris Gray will be their CRC Chair, and he reports that a smidgen of ASHRAE business might be done along the way. For East Tennessee members, this might be your last chance to socialize with Alabama fans while they are still friendly to us! Our chapter has historically done well in the Region, and we expect this year to be the same. Our outgoing President, Nancy McBee will be our Delegate, and our incoming President, Jeff DeLong will be our Alternate. Chapter Officers and Committee Chairs will attend workshops during the conference, and we encourage any interested member to attend and observe the workings of our Regional leadership. The image above is linked to registration. Please consider joining us in Birmingham! Chapter Roster to be Distributed at May Meeting! Our chapter's signature publication, the Chapter Roster, in its 2016 edition, has been printed and will be available for distribution at our May meeting. This document, first published in 1968, has evolved into a summary almanac of our Chapter - it now includes information on our Chapter's history, past leadership, research contributors and awards, as well as the traditional roster of members, manufacturer's representatives, and consulting engineers. Jonathan Driskill has led this committee for the recent past and has outdone himself this year. Our chapter owes a great deal of gratitude to Jon, and all that worked with him on this year's edition. Assisting on this year's edition were Alan Hasemeyer, Wayne Doane, Jack Hopkins, Nancy McBee, Andrew Meyers, Isaac Bosley, and Victor Mills. All chapter members will want to pick up a copy and see for themselves. For the first time ever, we are making excerpts of the roster available on our website. Click here for the initial link; we will be posting this in a more visible space soon. Come on out to the May meeting and receive your copy! Congratulations to the Roose Team - Ryan Roose, Brad Blackburn, John Buchanan and Pat Brooks on their low score for the Annual Hillbilly Classic Golf Tournament! We had a great slate of golfers who enjoyed one of the most beautiful Spring days so far this year. Three Ridges Golf Course was the site of this year's tournament, and they were a great host. Thanks so much to Tom Pace and Andrew Bosse for organizing this year's tournament. Hole sponsors were acquired for each hole and door prizes were donated as well. We appreciate Johnson Controls for sponsoring lunch! Save the date - Saturday, May 7th, 2016 as our spring lake party. We are making plans to have this event at the home of Tom Werkema. This has been an enjoyable event in the past as will certainly be so again. In case of rain - Sunday, May 8th will be the date. Rumor has it that boats, food, drink, yard sports, and great fellowship will be present. Thanks to our YEA committee for sponsoring this event! Our University of Tennessee Student Chapter placed second for Class I Exhibits during Engineers Day at the University! A plaque was presented to Student Chapter President Jeremy Miller by the College of Engineering Academic and Student Affairs Office. Congratulations to Jeremy and all of the student chapter! Meanwhile, Alan Hasemeyer recently traded in his historian hat for a brief stint as presenter to the Student Chapter. Alan discussed chilled water systems in particular, going over overall design concepts as well as some detailed information regarding design of piping networks and hydronics. Alan is pictured above giving his presentation. Thanks to Scott Hacker for his continued leadership for student activities. Please contact Scott with any questions! Friends of Literacy - with Alex Haley! The holiday season is upon us, and it will soon be time for our annual Past-president's Night and Christmas party. Cherokee Country Club will once again be the venue for our special event, and it will be specially decorated for our chapter. Tom Pace and Anne Jacoby have been our primary planners this year, and they have a special event in store for us! Social hour will begin at 6:00 pm; there will be a cash bar and finger food, with each attendee having one free drink ticket as part of their admission. Background music will be by Tim and Jonah; many of you will remember them from the Orangery a couple of years ago. We encourage everyone to come early and socialize! Dinner will begin at 7:!5, and it will feature the excellent cuisine of the Cherokee Country Club kitchen. Our Chapter President, Nancy McBee, will recognize past presidents in attendance and offer some brief remarks. Tom Pace will introduce our speaker for the evening, Mickayla Eldridge, who will discuss the Friends of Literacy program. Following the program, Tim and Jonah will continue to provide background music - we hope that everyone will stick around and enjoy the great venue. Complimentary valet parking will be available (the cost of this has been pre-paid by our chapter), and we encourage all attendees to utilize the service as on-site parking is limited. Please call or text Tom Pace (228-8467) (paceo@bellsouth.net) or e-mail Anne Jacoby (ajacoby@hobbstn.com) with your plans to attend. We anticipate a big crowd, so go ahead and get those RSVP's in early! Cherokee Country Club is located at 5138 Lyons View PIke; Knoxville, 37919, not far from the Papermill / Northshore Drive exit of Interstate 40. Single tickets are $50.00, each additional ticket is $40.00. Past presidents of our chapter are entitled to a complimentary ticket. If you have not already become aware, ASHRAE Society has a variety of ways that one can learn more on the topics of HVAC. For those that can arrange to attend an out-of-town seminar, Society offers training in a variety of cities. Upcoming courses include HVAC Design Level I - Essentials and HVAC Design Level II - Applications. Locations are as close as Atlanta, and as remote as Hong Kong or Kuala Lumpur. Try to get that one on your next expense report! If that expense report gets kicked back, consider one of the ASHRAE Learning Institute's 2015 Fall Online Course Series. About a half-dozen different topics are being offered this fall on a variety of topics. Consider buying a meal plan for the year! Eight meetings, not counting the December holiday meeting, would normally be $160.00. For $140.00, you can be prepaid and save $20.00 over the cost of paying individually. Meal plans are available through the October meeting and can be purchased through Andrew Myers, our new Chapter Treasurer. Our first official 2015/16 chapter event was held on Thursday, August 20, at the Beer Market in Bearden. This was a joint event with young leadership members of several construction related organizations. Around 50 young professionals attended, with over 10 of our own members included. Also a few of our Univeristy of Tennessee Student Chapter members were present, needing a break after the first day of class! This was a social event, allowing our young members to engage with others in the construction and design sectors. A fun time was had by all! Thanks go out to Andrew Bosse for organizing this event!